I’ve been really trying to find something my son will eat for lunch. He has numerous issues with food beyond being a picky eater. It’s more of a sensory issue — he’s on the autism spectrum. When I find something he will eat besides peanut butter and honey, I’m super excited. 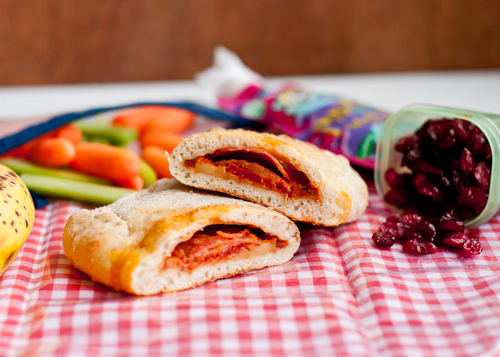 For Menu #21 of our Lunchbox Series, I made him homemade pizza pockets! (I can’t believe I hadn’t thought of it before!) Admittedly it’s not the healthiest of lunches, but every once in awhile I feel okay about it. And it’s a lot better than the pizza they have available at school. 1. Divide the pizza dough into four smaller balls. Let them rest for 15-20 minutes at room temperature. 2. Preheat oven to 425 degrees F. Line a baking sheet with parchment paper. 3. Roll each ball of dough into a medium-sized circle on a lightly floured surface. Let rest for a few minutes if the dough pulls back when it’s rolled. 4. Spoon a few tablespoons of the sauce on one half of each of the dough rounds, making sure to keep it about 1/2″ from the edge. Top with 1/4 cup (or more if you like extra cheese) and top with the pepperoni slices. 6. Place each of the pizza pockets on the prepared baking sheet. With a sharp knife, make several slashes/vents in the top of the dough. 7. Bake for about 15-20 minutes, or until golden on top and the cheese is bubbly. Let cool slightly before serving, or serve at room temperature. Note: I either make these the night before for dinner and make extras for lunch the next day, or make a dedicated batch for the purpose of school lunches. I keep them in the fridge overnight, wrap them up, and they kids eat them at room temperature. 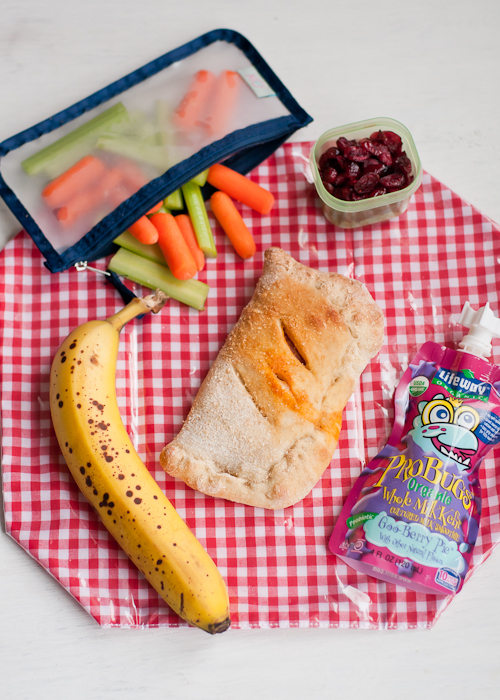 If you want them to stay warm, one idea is to heat them up in the morning and wrap them well in aluminum foil and place them in a small insulated bag — like the ones you see at the grocery store for keeping food hot/cold for several hours, or an insulated lunchbox minus the ice pack. When I was student teaching, one mom would always make a version of what the kids at school got in the hot lunch line to make her son feel involved with his peers. She always made pizza pockets on pizza day and he loved them. I will definitely try making these for my son. We love the whole wheat pizza dough at Trader Joe’s! Where did the food stories go? I love those. I was looking forward to reading about Christmas recipes and the tamales.